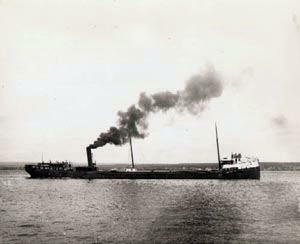 The Great Lakes freighter Fedora was steaming from Duluth to Ashland, Wisconsin, to pick up a cargo of iron ore when an exploding kerosene lamp set fire to the engine room. The incident happened on the night of Sept. 20, 1901, as the Fedora was passing Basswood Island, near Bayfield, on Lake Superior. The boat’s skipper, Capt. Frank A. Fick, told the Ashland News that the fire spread so fast that the crew was forced to flee the engine room, with the engines left running at full steam. Fick said the fact that the fire broke out in the engine room created a real dilemma. The vessel was left racing at full speed so life boats could not be used. And the pumps used to fighting a shipboard fire were located in the engine room, so it was impossible for the hoses to be charged. He said a strong southeast wind was blowing which fanned the fire and soon had the stern of the ship ablaze. Fick keep his head, however, and utilized the only options left to him. Since the pilot house was located near the bow, the crew still had access to it, and could steer the still moving ship. And Fitch said the flames lit up the night sky enough that he could easily see his way as he turned the burning vessel toward shore. He succeeded in beaching the flaming Fedora near Chicago creek, north of Buffalo Bay. The racing ship struck hard, tearing up the hull. Once stopped, the crew managed to drop a lifeboat and all 17 sailors escaped unharmed. The steamer struck shore so close to the Red Cliff Lumber Company’s yards and mill, and for a time the fire threatened to spread to the mill. It didn’t happen, however. The steamer burned to the water line and was written off as a total loss. The Ashland Daily Press described the ruins left after the fire took its toll. “The fire consumed everything of wood above the water line, and her frame remains a twisted and contorted mass of ribbons and beams, a most gruesome sight indeed. Her great engine stands erect, towering above the warped and shapeless iron boiler house, some twenty-five feet and seemingly unbroken. Indeed, the Red Cliff Lumber Company purchased the engine and put it at work at the mill. Nothing else from the wreck was salvaged. The Fedora was built by the F. W. Wheeler shipbuilders in Bay City, Michigan, in 1889. It measured 282 feet in length and was considered a very large ship in its day.